German driver Nico Hulkenberg will return to Force India in 2014 after signing a "multi-year" deal. 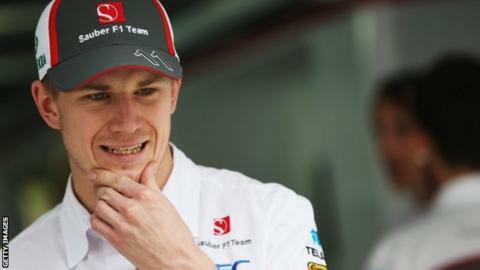 Hulkenberg, 26, who was in contention for a Lotus seat, raced for Force India in 2012 before moving to Sauber this season. Force India, who ran Paul Di Resta and Adrian Sutil this year, said they will name the second driver "in due course". Hulkenberg said: "I know this team and I can see their determination. We all share the same hunger for success." Hulkenberg had a very strong second half to his season, scoring points in six of the final eight races. That run included an impressive drive to fifth position at Monza, Italy, and a fourth in Korea the following month. It was that form which linked the German with a drive at Lotus, who finished fourth in the constructors' championship. However, Lotus needed an injection of funds and as a planned investment deal with the US-Middle Eastern consortium Quantum has so far failed to materialise, the Enstone-based team signed Pastor Maldonado. Maldonado comes with significant investment from the Venezuelan state oil company PDVSA, which has paid £30m a year for him to drive at Williams since 2011. Hulkenberg, who finished 10th in the drivers' standings in 2013 with 51 points, only has limited personal backing. The German made his debut for Williams in 2010, taking his maiden pole position in the penultimate race in Brazil. He joined Force India as a test driver in 2011 before being promoted to a race seat in 2012. That season, he scored points on 11 occasions, and even led the season-ending Brazilian Grand Prix, before crashing into Lewis Hamilton and recovering to fifth. Force India team principal Vijay Mallya said: "When he drove for us in 2012, it became clear Nico was an exceptional talent and he has continued to impress everyone in the paddock with his strong performances this season." Hulkenberg added: "The team is aiming high for next year and I believe that the experience I have gained over the years will help us achieve those goals. "I've heard a lot of positive things about the Mercedes engine as well, so I think there is a lot to be excited about for next year." Hulkenberg is expected to be joined by former McLaren driver Sergio Perez, with Di Resta set to lose his place in F1. The Scot is eyeing a move to US-based IndyCar racing.